So excited to share this fun slime kit party favor sponsored by Elmer’s as a part of their Crafty Parents Crew! It’s sure to be a fun birthday party favor or party “make and take” craft! With preschool & elementary-aged kids here in the house, we definitely have Elmer’s School Glue on hand. There’s so many fun ways to get crafty with it, but one of our favorite ways to use it is for making slime! It comes together SO quickly and the boys think it’s pretty much the best thing ever! It’s also a GREAT thing to make with a group of kids! In fact, in my science teacher days, I made it with whole classes of kids! So, it’s perfect for a birthday party “make and take” activity. 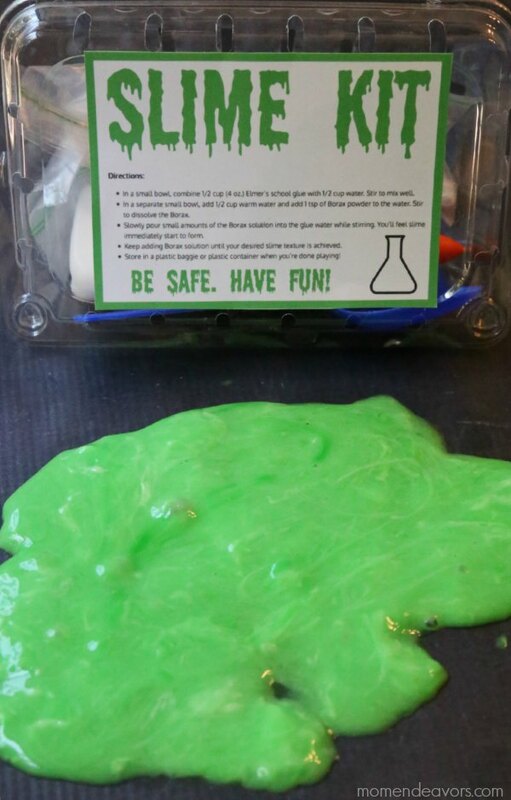 And, if you’re doing certain themed parties (like a Mad Scientist Party or Halloween party), sending the kids home with a “Slime Kit” is the perfect party favor!! Putting together the kits is SO easy! 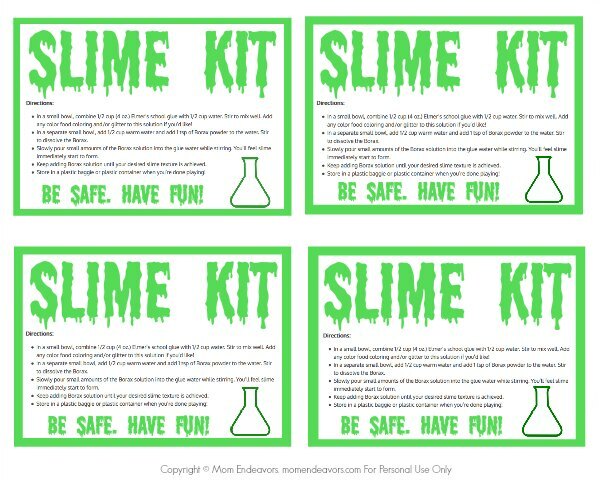 Just print out the “Slime Kit” Labels with slime-making directions (printing on card stock is recommended). 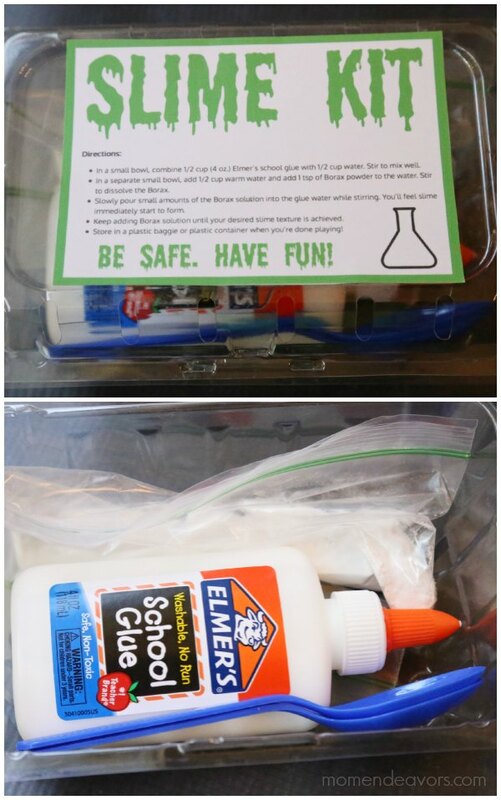 Then, place your Elmer’s glue and other ingredients into your slim kit containers. The only thing kids will need at home is water, bowls, and possibly food coloring. A party favor like this is so great as it’s easy to put together, inexpensive, and is something that kids can get creative with at home with their own parents! Love it! So fun! 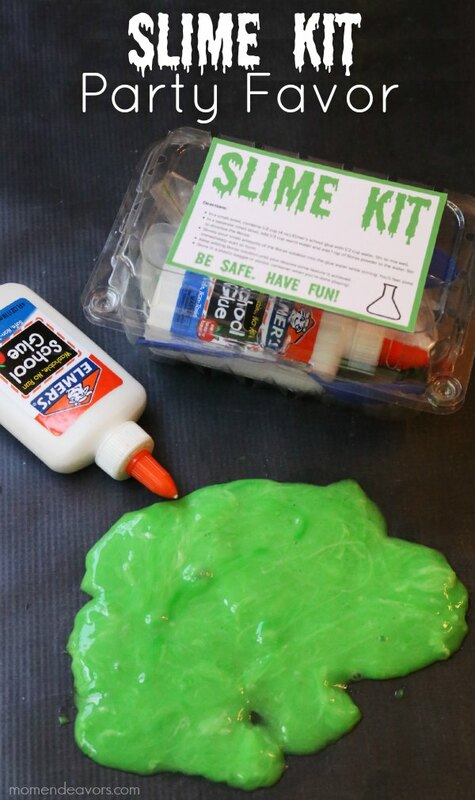 Would YOUR kids enjoy a slime kit? Disclosure: I’m a member of the Elmer’s Crafty Parents Crew. All ideas, opinions and experiences are entirely my own! We’ve been a fan of Elmer’s glue and making slime long before being sponsored by Elmer’s! I LOVE this idea! The printable turned out so great. I love this idea! I think this would make such a fun gift for boys….I have a few birthdays coming up! I might just need to use this for them! Thanks for sharing! Fun stuff. I will want to make some of this with Grandsons some rainy day! What a great idea! My boy will love this! I’ve been wanting to do this with the kids, makes them excited when they hear the word “science.” The printable just makes the whole thing soooooooo perfect! I love it! Thank you very much for sharing this with us. This was perfect for my last minute party favors- thanks! I just put together Slime Kits for my son’s 6th birthday party! They were so easy to do, I already had a bunch of the supplies on hand, and the printable was great! I know they’re going to be a hit! Thank you for such a fun, unique, affordable, non-candy party favor! This will be great for our sons Ghostbuster birthday party!! Thank you!!! Yesss! That is perfect!!!! So fun! I love this. I think crafts make such great favors. Do you have any suggestions on how to include some coloring for the slime? Maybe tint the glue yourself?